Composer of several tens of tape music pieces alone or in collaboration with, notably Jean-Luc Guionnet, Eric Cordier has been invited in the contemporary music studio : GRAME (Lyon) from 89 to 91 & la Grande Fabrique (Dieppe) from 92 to 98. He works in his personal studio since that time. Eric Cordier, close to “musique concrete”, has built a musical style in which the sound texture is always used in the respect of his own specificities, limiting the impact of the sound treatments. Each musical piece is composed around a strong concept or a deep thematic, according to questions of society or memory. 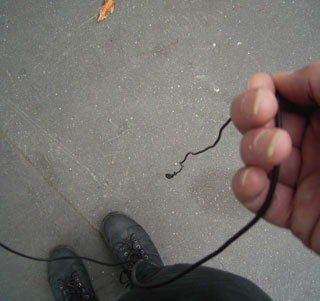 Beside numerous “électroacoustiques” compositions for tape only, Eric Cordier’s experience in matter of mixed music is based on collaboration with improvisers : Seijiro Murayama, Jean Luc Guionnet, Dominique Regef, or contemporary musicians as Georges Pennetier. His music has been premiered in the following : Synthèse (Bourges), Why Note & Diese (Dijon), Tramway (Rouen), Mémoire Vives /actart77, Excentrique (Chaumont sur Loire), Licences (Paris), Ca vaut jamais le réel (Montreuil), Bonlieu Scène Nationale (Annecy), RME (Chartres) et jouées à Futura (Crest) en 96 et 08, at theatre Merlan (Marseille) & Drakkar-DSN Dieppe Scène Nationale. -Breizhiselad, CD, 71‘, Erewhon, (B), 2006. -Hierre, (V.A.) Erratum #2, 19′ 39", Besançon (F), 1999. -Houlque, CD, 73‘, +booklet, La Grande Fabrique, (Dieppe, F), 1996. – Dispositif Canal Saint Martin, (with E. Mieville), XingWu, (Malaysia), 2007. – Afflux (with E La Casa & JL Guionnet) Bordeaux TNT, CD 70′, Alluvial Rec, (USA), 2006. – Afflux Air stream/Water stream : Aizier, Dieppe… , CD 51′ 11", Edition …, (USA), 2002. – Afflux Bouquetot/Paris/Port-Jérôme, CD 70′, Ground Fault, (USA), 2002. He has studied fine arts help him to built some projects at the border between fine arts and music : creating some sound environments some sound-sculptures with Denis Tricot (Orgue de Bois/ Wooden Organ) & Jean-Luc Guionnet (Synapses) and some performance/action/body art focusing on speaking and interface human / machine, keeping the connection with actionism (ref : New-morning 10 2001; Compilation Shambala "Ramper, c’est voler"). It continues in “Ruderal” with Satoko Fujimoto (sound) (tour in Baltic countries & Russia April 2008). He has work at the national broadcasting company France Culture as producer of some radio programs for ACR, Nuits Magnetiques and Clair de Nuit. He has been invited in festivals Free Music (Antverpen), AVE (Mijmegen & Maastricht), Laerm Struktur Festival (Stuttgart), NPAI (Parthenay), Densités (Fresnes-en-Woevre), Fruits de (Mhere), (Caen) ; theatre TNT (Bordeaux), Lieu Unique & Pannonica (Nantes), Aéronef & Crime (Lille), CCAM (Nancy), 102 (Grenoble), Instants Chavirés & New Morning in Paris.